Some people consider a life-cycle "model" a more general term for a category of methodologies and a software development "process" a more specific term to refer to a specific process chosen by a specific organization. 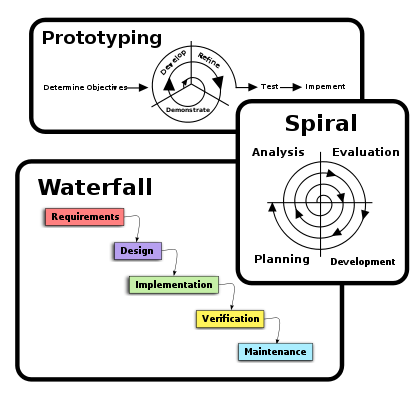 For example, there are many specific software development processes that fit the spiral life-cycle model. 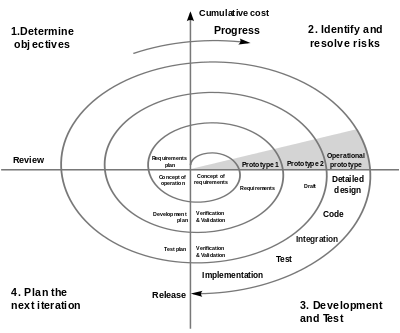 The field is often considered a subset of the systems development life cycle. Several software development approaches have been used since the origin of information technology, in two main categories. Typically an approach or a combination of approaches is chosen by management or a development team. "Traditional" methodologies such as waterfall that have distinct phases are sometimes known as software development life cycle (SDLC) methodologies, though this term could also be used more generally to refer to any methodology. A "life cycle" approach with distinct phases is in contrast to Agile approaches which define a process of iteration, but where design, construction, and deployment of different pieces can occur simultaneously. The term was first used to describe a software development process introduced by James Martin in 1991. According to Whitten (2003), it is a merger of various structured techniques, especially data-driven information technology engineering, with prototyping techniques to accelerate software systems development. The activities of the software development process represented in the waterfall model. There are several other models to represent this process. Offshore custom software development aims at dispatching the software development process over various geographical areas to optimize project spending by capitalizing on countries with lower salaries and operating costs. Geographically distributed teams can be integrated at any point of the software development process through custom hybrid models. The three basic approaches applied to software development methodology frameworks. ^ a b c d e f g Centers for Medicare & Medicaid Services (CMS) Office of Information Service (2008). Selecting a development approach. Webarticle. United States Department of Health and Human Services (HHS). Re-validated: March 27, 2008. Retrieved 27 Oct 2008. ^ a b Geoffrey Elliott (2004) Global Business Information Technology: an integrated systems approach. Pearson Education. p.87. ^ saeeda, Hina; Khalid, Hannan; Ahmed, Mukhtar; Sameer, Abu; Arif, Fahim (2015-09-01). "Systematic Literature Review of Agile Scalability for Large Scale Projects". ResearchGate. 6 (9). CiteSeerX 10.1.1.695.4994. doi:10.14569/IJACSA.2015.060908. ISSN 2156-5570. ^ a b Whitten, Jeffrey L.; Lonnie D. Bentley, Kevin C. Dittman. (2003). Systems Analysis and Design Methods. 6th edition. ISBN 0-256-19906-X. ^ Wasserfallmodell > Entstehungskontext, Markus Rerych, Institut für Gestaltungs- und Wirkungsforschung, TU-Wien. Accessed on line November 28, 2007. ^ Conrad Weisert, Waterfall methodology: there's no such thing! ^ Barry W. Boehm (2000). Software cost estimation with Cocomo II: Volume 1. ^ Stephanie Overby (1 October 2012). "7 Tips to Offshore Agile Development". Cio.com. Retrieved 12 March 2019.